Dan and I were at a wedding with our friends Justin and Cassandra when we started talking about Chicago. Dan and Justin had both been, but Cassandra and I hadn’t, so we talked about how that summer we should all go together. Fast forward to the spring and Justin and Cassandra started sending us potential dates to go, so soon the trip was booked (this was great because usually we just talk about how we should go somewhere and don’t get organized enough to plan). We also got a good seat sale on Porter and set off on our trip in August 2011. Ready to fly to Chicago! We were almost late getting to our flight. I got home later than expected and we didn’t have time to take the TTC and shuttle over to the Toronto Island Airport. Because of this, we flagged a cab and told him we needed to get there, asap. The cab driver was amazing and pulled a lot of Batman moves. His name was Hella Rosenbaum and we were truly grateful. We made it a little before boarding. 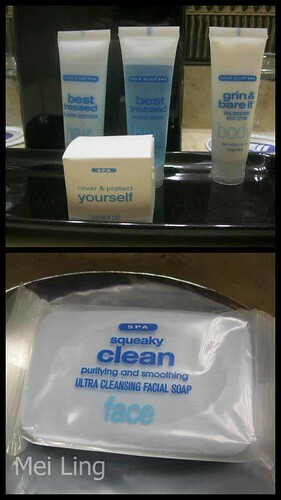 I actually can’t remember what hotel we stayed at, but I really liked the packaging on their shampoo and soap. I love this packaging. I even took the bottles of shampoo and conditioner to use at the gym. 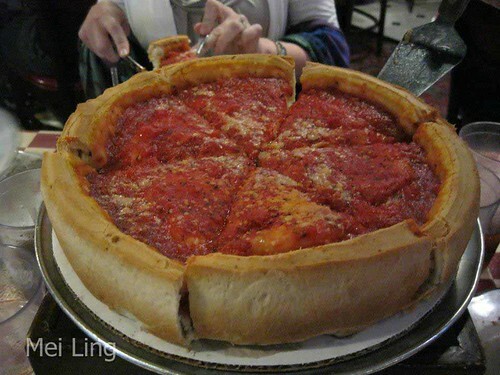 We were feeling hungry so we asked the concierge where to get Chicago deep dish pizza. I was particularly excited for this after eating real New York pizza a few months before. 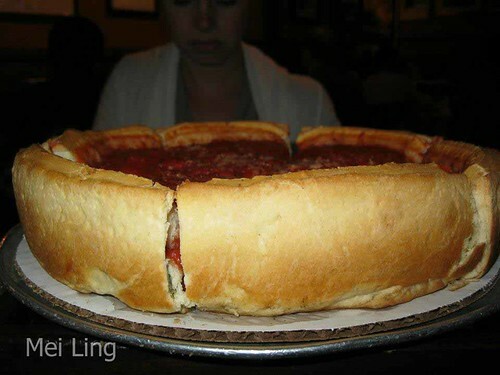 The concierge asked if we wanted the pizza to be cheesier or meatier. I wanted the cheesier pizza, but Justin wanted the meatier pizza. We decided that we would try both on our trip. 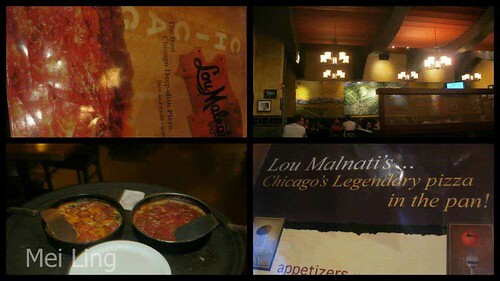 The concierge had a coupon for Lou Malnati’s (the place with the meatier pizza) so we headed over there. 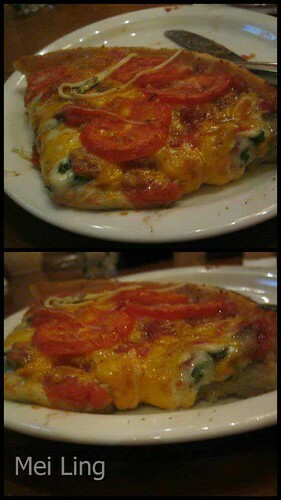 The pizza was amazing and so filling! We were stuffed. The coupon our hotel gave us entitled us to a free dessert so we ordered a Chocolate Chip Pizza. After this I felt like we had to roll back to the hotel room. 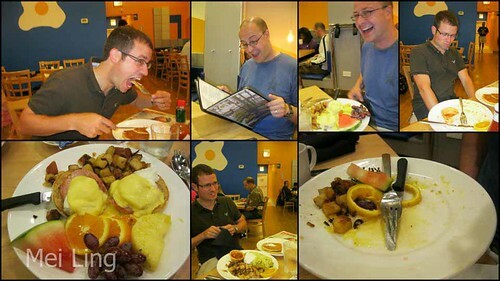 But this was an eating trip so the next day we got up and went to Yolk for breakfast. We ate a lot for breakfast at Yolk. om nom nom. I crushed it. On our way out I took a picture outside of Mei’s Kitchen. We didn’t eat there but I liked the name (for obvious reasons). 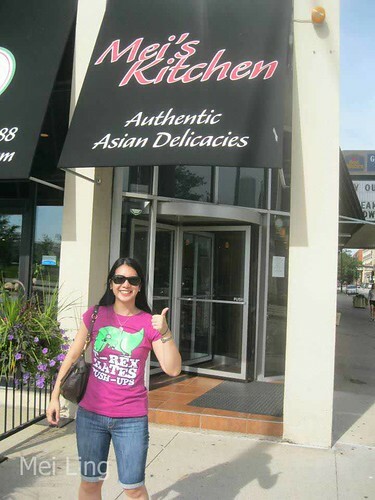 Thumbs up to the sign for Mei’s Kitchen. Maybe one day I’ll go back and try their food. I wonder if I get a discount for being a Mei? 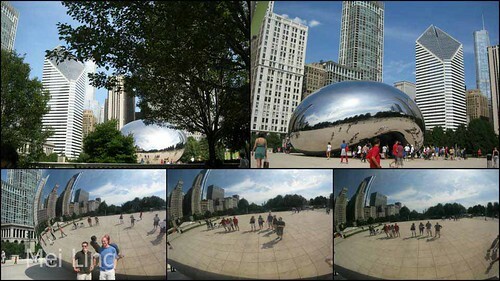 Cloud Gate or “The Bean” in Millennium Park. 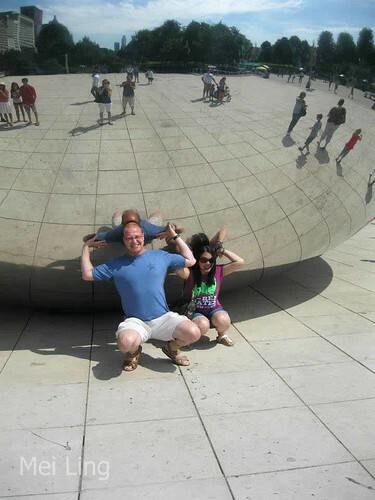 Dan and I tried to lift or carry the bean on our shoulders. 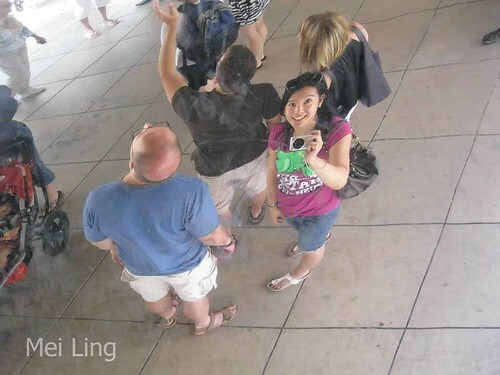 I took this picture from beneath the bean. 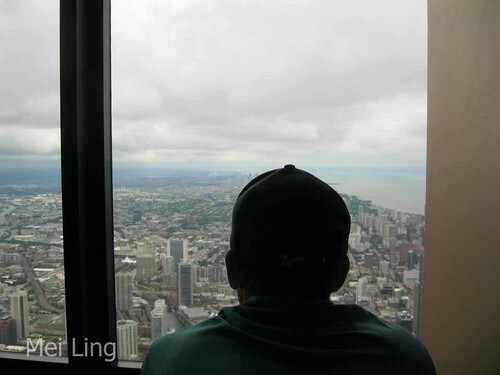 From here,we wandered through Chicago and explored their green spaces. They have a lot of beautiful parks and places to walk and we talked about how we wished Toronto had more green spaces like this. 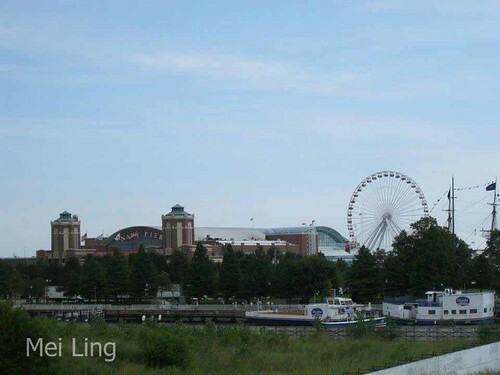 After a nice long walk, we headed over to Navy Pier. Dan bought some Italian Ice to eat and then we bought tickets to the Ferris Wheel. We found out when we tried to get on that no food or drink was allowed, so we had to wait for Dan to finish his Italian Ice. He said it was worth it. The view from the Ferris Wheel. They played songs about Chicago like Frank Sinatra’s “Chicago.” They didn’t play “Chicago” by Sufjan Stevens though (this is where my blog title came from. Though I guess it’s not really a song about the city). 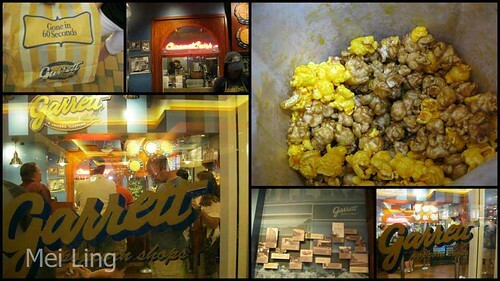 While we were at Navy Pier we also found Garrett Popcorn and bought and ate tons of it. I love their Chicago mix (mix of cheese popcorn and caramel popcorn). It sounds weird but it is delicious and addictive. 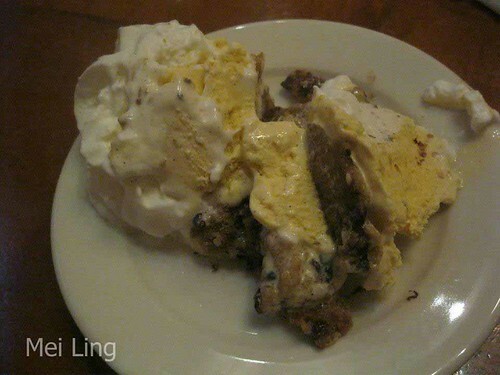 Just thinking about it now I want some. It’s also fun to try to mix up the ratio between cheese and caramel popcorn (like 2 cheese to 1 caramel or vice versa). Most of the time I just ate it at random. 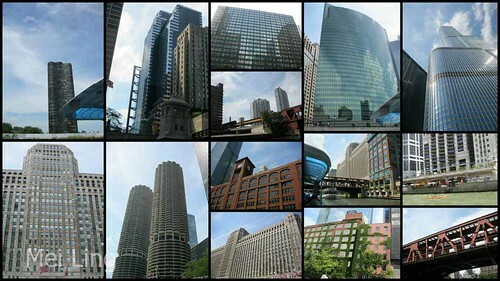 As we stuffed our faces with popcorn we continued to explore Chicago. 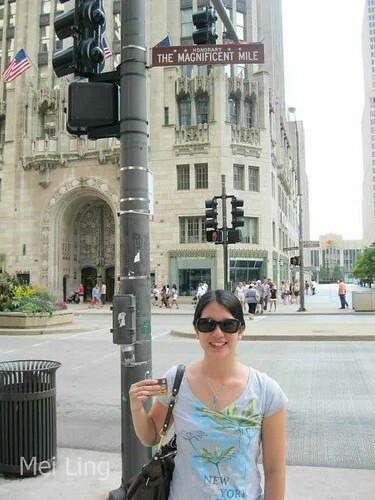 We went back to the downtown core and past the Tribune building. 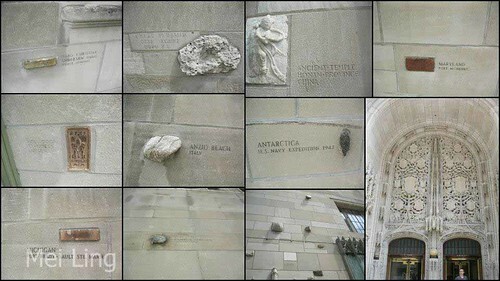 The Tribune Building has fragments of other famous buildings and monuments from around the world embedded in it. We also saw the “Forever Marilyn” piece before it was removed. Forever Marilyn was dismantled less than a year later and is now on display in California. You can watch a video of the statue being dismantled on Huffington Post. 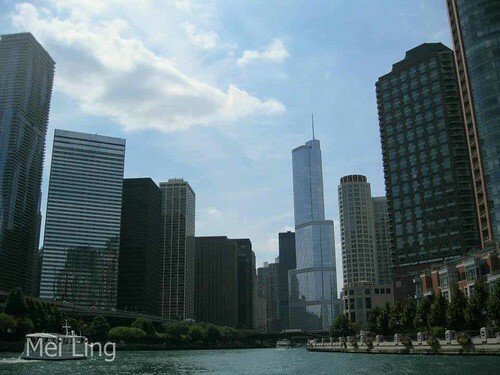 It was a beautiful day so we took a boat tour with Mercury Skyline Cruises to learn about the architecture of all of Chicago’s famous buildings. 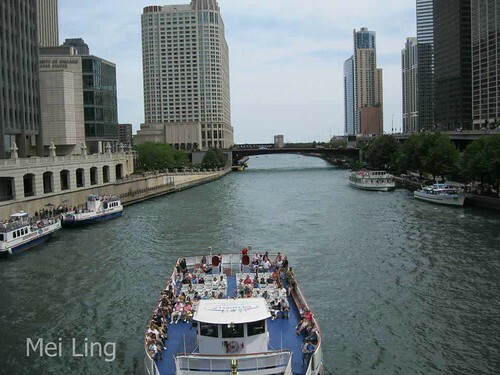 Enjoying the architecture of Chicago on our river tour. 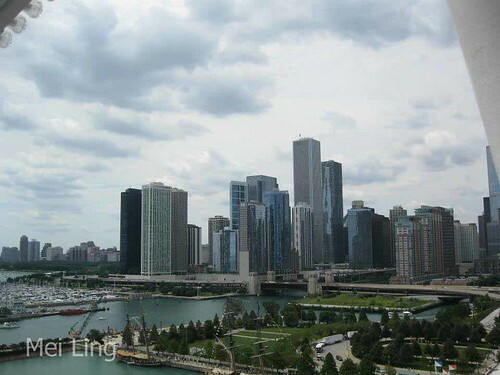 Part of the Chicago skyline. Looks a bit like Gotham City. After the tour we stopped in for lunch at a random restaurant. 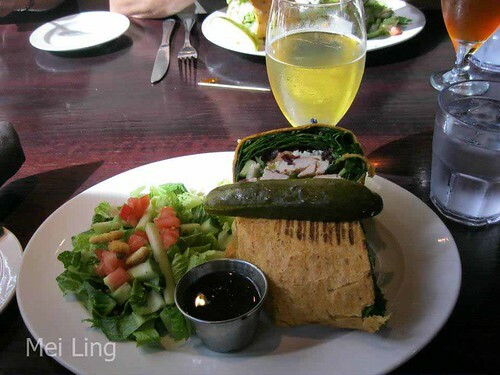 I was feeling really full from all of the food we’d been eating so opted for a lighter lunch. My light lunch consisted of a chicken wrap and a salad. om nom nom. Had to give my stomach a chance to recover! 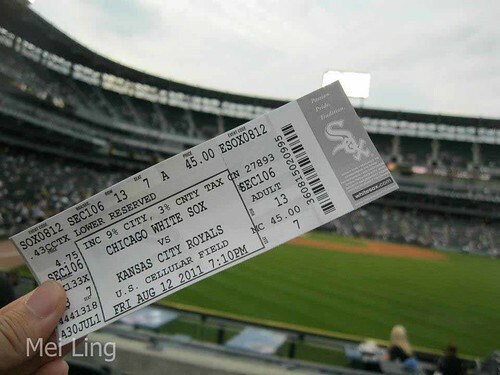 That evening we went to a White Sox game (we were still full from all of the eating). We wanted to see the Cubs but they weren’t in town. Dan had a lot of fun heckling Alex Rios. Ready for the White Sox game at Cellular Field. We got free t-shirts. The next day we had a quick breakfast and continued to wander around. 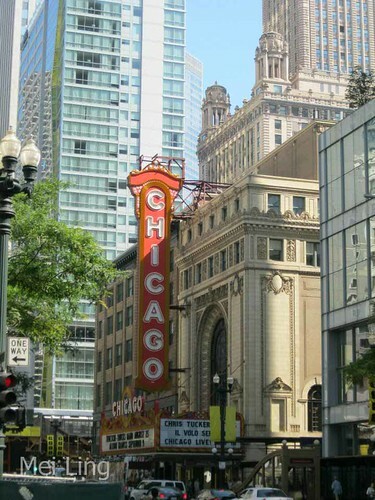 We walked past the Chicago Theatre and its famous sign. 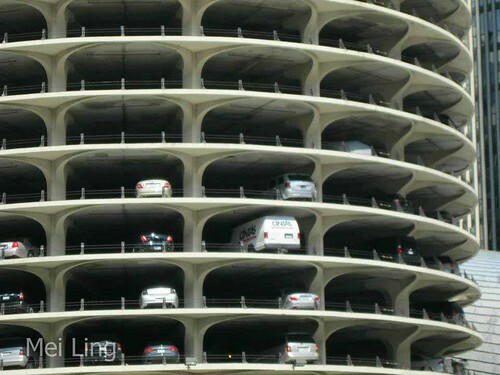 Backing in to park at the corn cob building must be hard. I grabbed Dan’s credit card at Magnificent Mile, determined to do some shopping. We weren’t very successful. 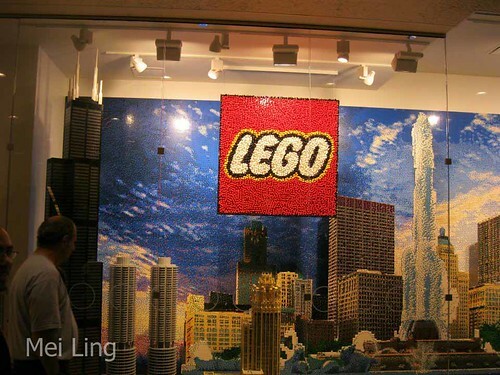 The Lego Store is always cool. I was successful at a store called AKIRA where I bought two dresses and a skirt at a really good price (they were having an amazing sale). We took the EL to another station and transferred to a bus. On our way it started raining and then it started hailing! We could hear and see it pounding down on the bus. Yes, hail in August. 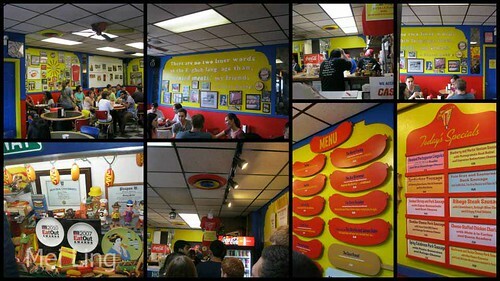 We were on our way to Hot Doug’s for gourmet hot dogs. 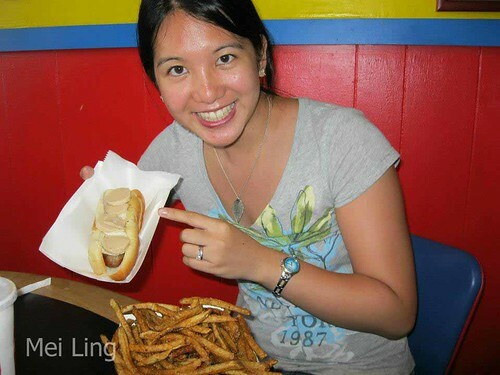 I had heard that their hot dogs were amazing and that people line up for hours for them. As we sat on the bus we all started wondering if the hot dogs would be worth the crazy weather. I actually thought maybe it meant there would be less of a line up. I was wrong. 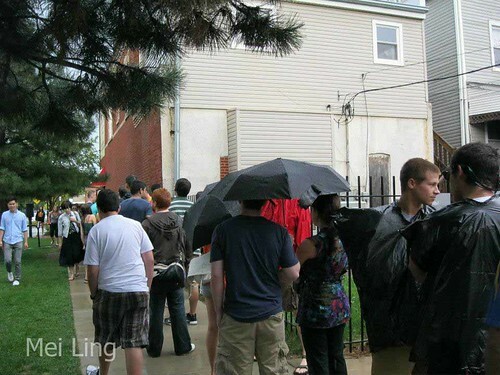 People stood in the line through the rain and hail. They must be worth it. We ended up standing in line for hours. 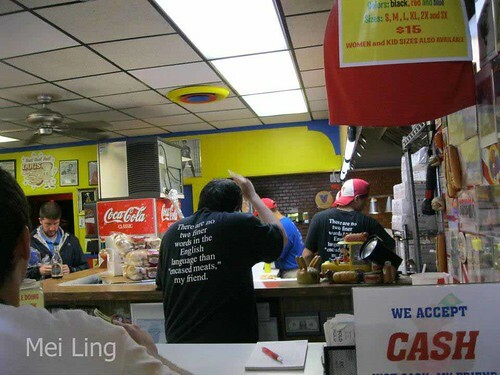 Dan and I are used to lining up for food, but I bet Cassandra and Justin wanted to kill us. The boys in line in front of us were hilarious. 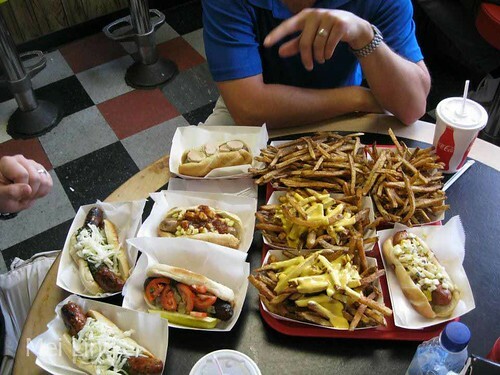 They were local high school boys who told us that the line up was worth it (they were regulars) and said that the funny thing with Hot Doug’s is that at the end when you finally got your hot dog you felt like you had achieved something. That was good enough for me! After hours in line we finally made it inside. I was full of joy when we made it to the front of the order counter. Doug himself was manning the counter and had a such a radio voice. He was also super nice. The food was amazing, and I did feel accomplished. Once again we stuffed ourselves and spent much of the rest of the day cursing Doug (“Damn you Doug and your ridiculously delicious gourmet hot dogs and fries!”). After our Hot Doug’s adventure, we went back to the downtown core where Dan and I stopped to enjoy some coffee while Justin and Cassandra went shopping. 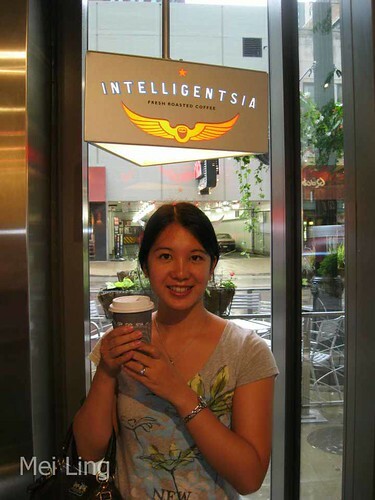 My friend Nate, who runs a coffee blog, had recommended Intelligentsia Coffee, so naturally we headed there. With my amazing Intelligentsia coffee. They gave me a to-go cup for the coffee I didn’t finished. It was filtered through a syphon. 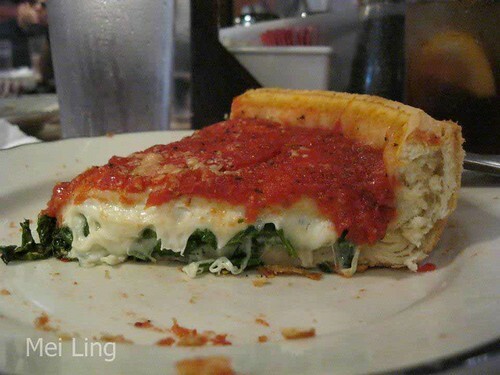 We had talked about getting more deep dish pizza for dinner, but at this point we were all feeling pretty sick from all of the food we’d be eating. Instead we opted to take a nap at the hotel and then head out to Howl at the Moon. Our helpful hotel concierge gave us a voucher for free cover to get in. Howl at the Moon was amazing! 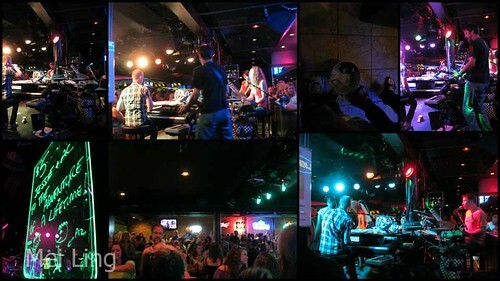 It’s a duelling piano bar and they can play pretty much every song. They also throw in more instruments and rotate (everyone can sing and play everything it seems). They also know every college song so there’s always a duel that way too. Lots of fun at Howl at the Moon. They also played “Walk the Dinosaur” and all of their bar staff did the Walk the Dinosaur dance on top of the bar. 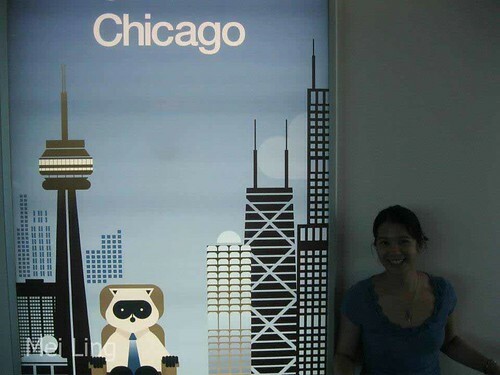 On our last day in Chicago we went to the Sears Tower (or I guess it’s called the Willis Tower now). It was a little cloudy but we still had a good view of the city. 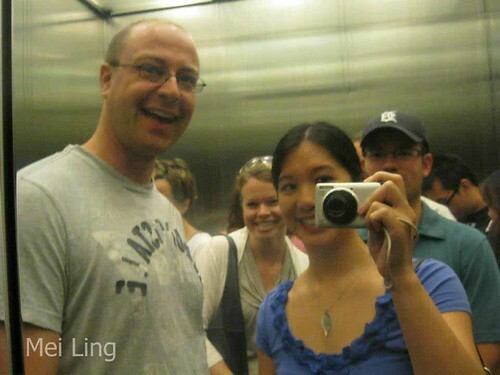 Dan and I love visiting tall towers and buildings, so this fit in with our usual trip itinerary. 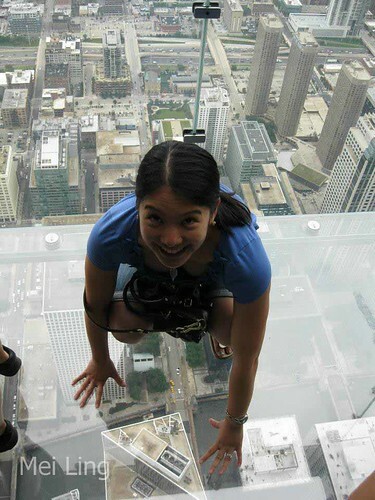 The glass floor is a little different from the one at the CN Tower. Dan felt dizzy when he stepped on it. 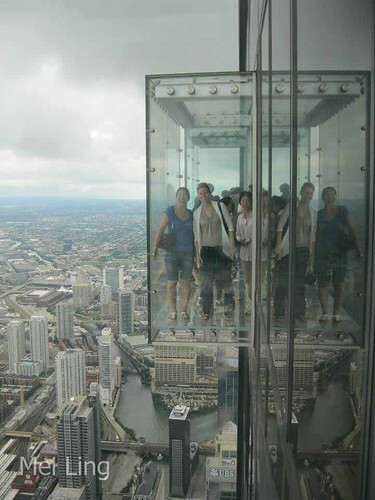 Cassandra and I in one of the glass floor sections in the Willis Tower. 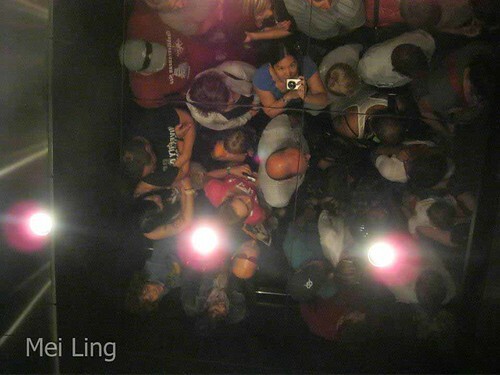 I managed to get this picture of the four of us reflected in the elevator before the doors opened. 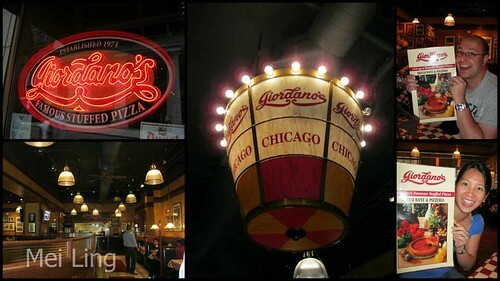 We went across the street for lunch to Giordano’s for the “cheesier” version of Chicago’s deep dish pizza. 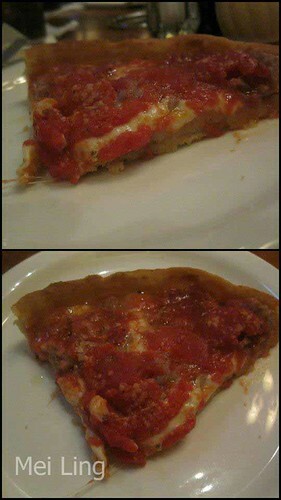 We couldn’t leave Chicago without sampling a few versions of their famous deep dish pizza. Again, we ordered two small pizzas, which was more than enough to feed the four of us. With another successful eating trip done, we headed home (probably 10 lbs heavier). Next up, I’ll recap my trip to Orlando and running my first half marathon, the Disney World Half Marathon! Was it the happiest race on earth? Stay tuned to find out.